At Cleveland Airport Marriott, your stay begins virtually the moment your plane touches the ground, thanks to our complimentary shuttle to and from Cleveland Hopkins International Airport. Additionally, our hotel's convenient location offers the ideal spot to discover some of Ohio's most renowned attractions, such as the Cleveland Metroparks Zoo, International Exposition Center and Progressive Field. Treat yourself to a delicious meal at AMP 150, our signature restaurant and lounge, serving a multitude of locally inspired dishes, paired with handcrafted cocktails and upbeat playlists. Finally, when you need a moment to relax, withdraw into our spacious accommodations. Whether you want to indulge in self-care in our marble bathrooms, finish up work using our ergonomic workstations or simply enjoy a peaceful night's rest on our plush bedding, you'll find exactly what you need in our rooms and suites. 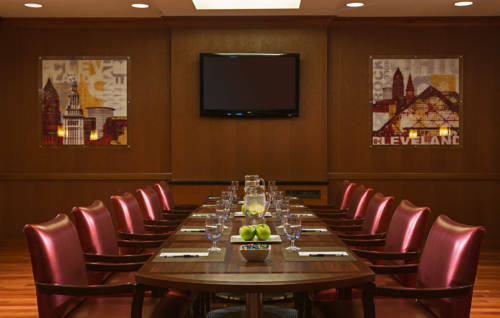 No matter the reason for your trip, Cleveland Airport Marriott will provide an experience you won't soon forget. AMP 150: Named after the Fender amplifier, this restaurant serves up Cleveland-inspired cuisine made with local ingredients and just a dash of rock 'n' roll. Stop by in the morning for specialty coffee or for the full bar and delectable food later in the day. AMP 150 Lounge: Kick back and relax at AMP 150 Lounge. Our bar and lounge offers plenty of open space, upbeat music and handcrafted cocktails to allow you to let your hair down after a long flight into Cleveland Hopkins International Airport. Starbucks : Jump-start your morning with a classic Starbucks beverage or pastry before your upcoming day of business or adventure. Fresh Bites: Designed with our busy guests in mind, Fresh Bites is our in-room dining option, providing fresh, local ingredients straight to your hotel room. Simply give us a call to let us know what you'd like and we'll have it delivered to your door within minutes.